Jeff Formby's photo of this tornado is the best i've seen of any southeastern tornado. What a monster. Links above are dead so I found and uploaded to Flickr. 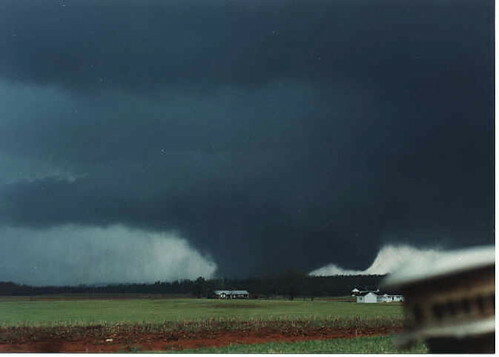 Agreed, was one of the best ever taken in the SE until last year's outbreak. Notice the vent stack to Jeff's storm cellar in the lower right of the image. I observed the wall cloud on this monster minutes before it developed into a tornado. My vantage point was in Moody, Alabama. Is this one the one that hit the church?